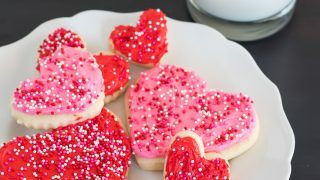 Easy Valentine’s day gluten free sugar cookies are soft and cakey gluten free heart shaped sugar cookies with fluffy frosting. Dairy free and vegan options. How do you make gluten free sugar cookies for valentine’s day? My gluten free sugar cookies were my first gluten free recipe to ever “make it big”. They went crazy on Pinterest when I first posted them more than 6 years ago, and continue to go crazy every Christmas and Valentine’s Day. I often make round gluten free sugar cookies, and even have a easy drop cookie gluten free sugar cookie recipe for when I’m feeling super lazy. I wanted to show you that it can be easy to make gluten free heart sugar cookies too! I’ve got some tips and tricks to keep things as simple and easy as possible. I know how busy holidays are, and Valentine’s Day is so exception. Make it easier on yourself and make gluten free heart sugar cookies the easy way! 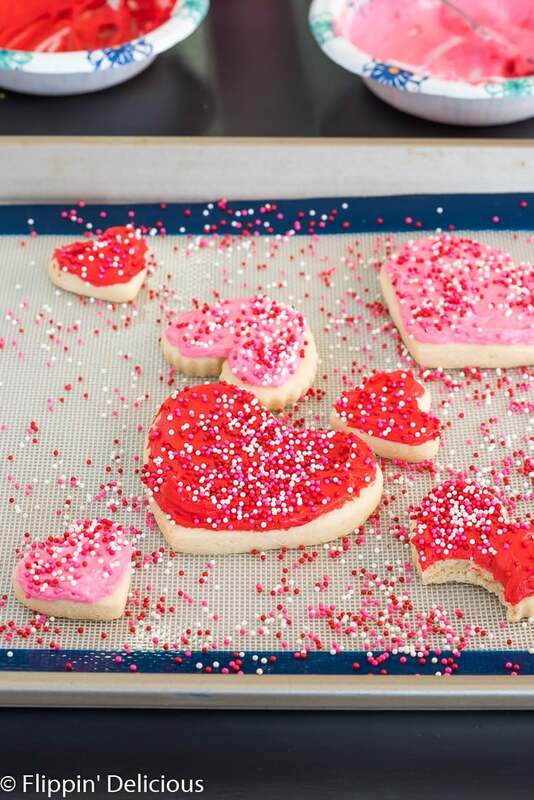 Making Valentine’s Day sugar cookies can be a bit of an ordeal. You need to save time and energy where ever you can! 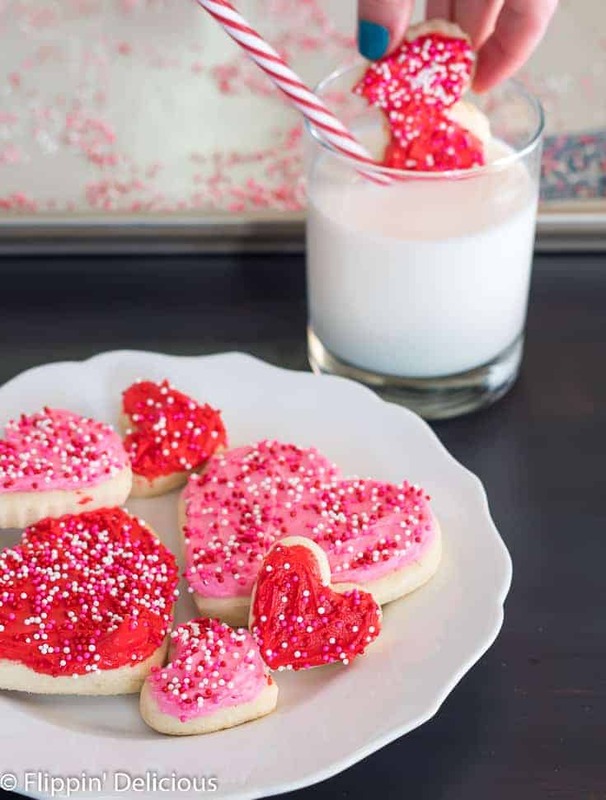 No chilling is required to make my easy Valentine’s day gluten free sugar cookies. You mix the dough, and go straight into rolling, cutting, and baking! Roll the dough between layers of plastic wrap. Not only does this prevent you having to add extra flour, which will make tough and crumbly cookies, it also is a big time-saver when it comes to clean up. Wipe down your rolling pin, and gather the plastic, and clean up is done! Pick simple cookie cutters. I used 3 different simple heart cookie cutters. One had a zig-zag edge but the other two were just smooth basic hearts. A simple design is easier to cut out and easier to decorate. Use store-bought frosting! Surprisingly, many store-bought frostings are dairy free and gluten free. Read the labels, and you may find one that works for you. Buying your frosting can be a big time saver if it works with your diet! Forget the fancy tips and intricate decorations. I divided my frosting into two bowls and tinted them red and pink. I simply spread the frosting on the cookies with a knife, and then topped them with Valentine’s non pareil sprinkles. You can make it even easier by choosing only one color, or even keeping the frosting white and using sprinkles for your color. Do you need gluten free sugar cookies for another holiday? I’ve got you covered. 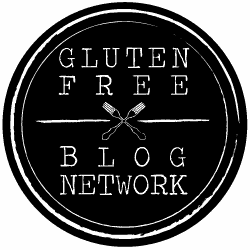 I’ve been working on a guide with an entire year’s worth of gluten free sugar cookies, which will be ready soon. For now, look through all of my gluten free sugar cookie recipes. What gluten free flour makes the best gluten free sugar cookies? I usually use my gluten free flour blend to make my gluten free sugar cookies. I recently started testing other flours in the recipe, and made a shocking discovery. Many gluten free flour blends absorb more or less liquid and when using Bob’s Red Mill One to One gluten free flour (the one with the blue label) I actually needed a lot LESS flour because it absorbed more liquid than my blend. This recipe calls for 3 1/4 cups of gluten free flour. If you use a different gluten free flour, I would recommend adding 2 3/4 cup, and then adding the remainder 1/4 cup at a time. You can see the proper texture my gluten free Halloween sugar cookie recipe video. The other important note with flour is how essential it is that you measure it correctly. If you scoop your flour directly with your measuring cup, you’ll pack too much in resulting in dry and crumbly cookies, and a dough that is difficult to work with. Spoon your gluten free flour into the measuring cup. Can I make gluten free sugar cookies dairy free? Can I make gluten free sugar cookies vegan? My gluten free sugar cookie recipe works great with an egg-substitute. I’ve listed my favorite egg replacers in the notes of the recipe. My favorite right now is Bob’s Red Mill Egg Replacer, but I often find I need to add a little extra water to it so that the cookie dough has the right consistency. Bob’s egg replacer calls for 2 tablspoons of water, but I’ve had better results if I use 2 1/2-3 tablespoons of water instead. Did you know that cancer is the #1 cause of death of children by disease in the U.S.? There are 40,000 U.S. children actively battling cancer right now. 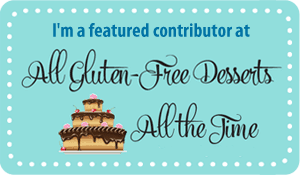 I participated in the event last year, sharing my gluten free red velvet crinkle cookies, and talked about a coworker’s son who had been diagnosed with leukemia. It has been heartbreaking to watch what their family has been going through, and particularly hit home because their son is the same age as my younger daughter. Help me, and the rest of the participating bloggers, make a difference by donating to Cookies for Kids’ Cancer! With less than 4% of the National Cancer Institute’s budget going to all childhood cancer combined, I knew it was important for me to get involved. Our goal is to raise at least $3000. Because these three companies: Dixie Crystals, Mediavine and OXO have each pledged to match our donations raised through this campaign up to $3000! Here are all of the other bloggers participating. You’ll even find a few gluten free Valentine’s day treat recipes! Easy Valentine's day gluten free sugar cookies are soft and cakey gluten free heart shaped sugar cookies with fluffy frosting. Dairy free and vegan options. 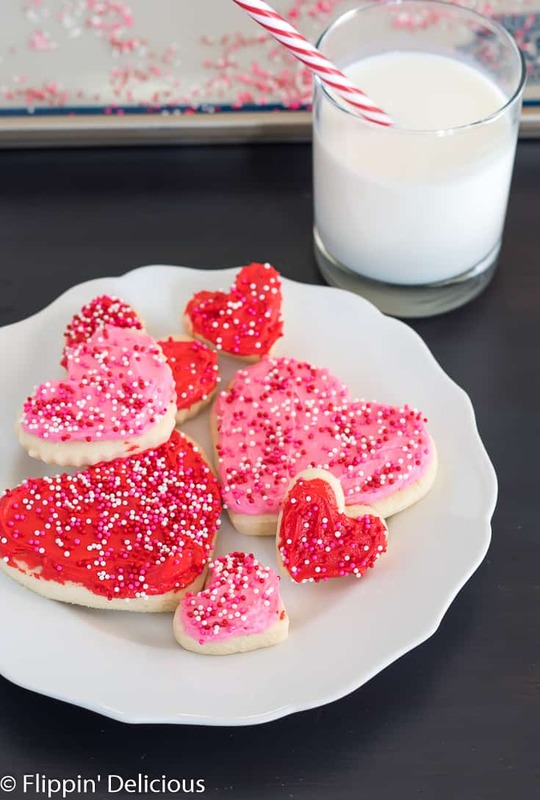 Roll the cookie dough between two sheets of plastic wrap and cut out with your favorite heart shaped or Valentine's Day cookie cutters, or use 3 inch round cookie cutters or a drinking glass. Frost as desired with my American Buttercream or Vegan Buttercream. To make your cookies dairy free or vegan use vegan butter or palm shortening (or my personal fave, half vegan butter + half palm shortening) instead of the butter and use a flax egg or your favorite egg replacer instead of the eggs. To make a flax egg, for each egg mix 1 tablespoon ground flax meal with 3 tablespoons hot water and let it sit for 5 minutes to thicken. Since this recipe calls for 2 eggs, you will need 2 tablespoons of ground flax meal and 6 tablespoons of hot water. My favorite store-bought egg replacer is Bob's Red Mill's Egg Replacer. Brianna, Thank you for a beautiful recipe for such a worthy cause! Thank you Susannah! I can’t wait. Thank you for helping with the cause. Mediavine matching the blogger donations made a huge difference!